Greater Washington is one of the most prosperous and well-educated communities in the nation. Even during the Great Recession, the regional economy has remained strong overall, shedding relatively few jobs. We cannot take our continued prosperity for granted, however, given predictions that federal spending cuts will result in the loss of as many as 450,000 local jobs in the coming decade. While the region is separated by state and city boundaries, political disagreements, parochial interests; and not one, but two rivers, it is the economic and educational differences that most starkly divide our citizenry. Despite the overall affluence, there remains an enormous gap between those who have the knowledge, skills, opportunities and resources they need to enjoy a healthy, productive life and those who don’t—particularly among the area’s children and young people. Greater Washington has gained a reputation as having a transient population, but the reality is that young people raised here will play a significant role in shaping the region’s long-term economic and social well-being. More than 1.5 million children and youth call Greater Washington home. This report paints a statistical portrait of the region’s children and youth—what they have in common and how they differ, including, importantly, how they differ by where they live. Across the region, there are barriers and opportunities that will shape and influence our young people’s odds of future success. While previous studies have provided important and valuable research on specific issues and/or focused on data from individual communities and specific parts of the region, this is the first comprehensive look at the state of children and youth across Greater Washington that identifies the trends and issues that will shape a generation critical to our collective long-term health and sustainability. By applying a regional lens to the challenges confronting our youth today, VPP and our partners seek to catalyze a conversation among all stakeholders, including government, business, nonprofit, philanthropic and civic leaders. The data provides a starting point for determining priorities and tracking progress throughout the region, including the District of Columbia, Montgomery and Prince George’s counties in Maryland, the cities of Falls Church and Alexandria and the counties of Arlington, Fairfax, Loudon and Prince William in Virginia. The needs of the area’s children and youth do not stop at jurisdictional boundaries—and neither should our efforts to ensure their future well-being. By examining the strengths and challenges faced by the children and youth in the region, we expect this report will provide a basis for a shared understanding of the issues affecting us individually and collectively. In an era of diminishing resources, investing in our children makes good sense and provides a strong return. But no local government or individual sector can do this alone. To make a deep and lasting impact on the lives of today’s children and for the next generation and beyond, there must be collaboration, innovation and a shared understanding that the cost of inaction will be unacceptably high—not only in terms of lost potential, but in the rising costs of programs and services that will drain away increasingly scarce dollars. When our young people fail to reach their full potential, we all pay a price. With this report, we call upon leaders throughout our region to declare the social and financial costs unacceptable and to signal their willingness to chart a new path against the backdrop of a shared destiny. VPP would like to thank the following organizations for their generous support. 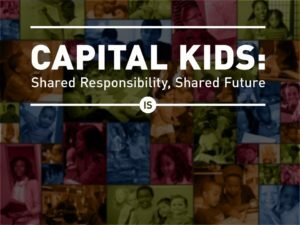 Without their commitments, Capital Kids: Shared Responsibility, Shared Future would not have been possible. We would also like to thank Child Trends for the research at the heart of the report.